Rosel Hoffberger Schewel ’71 MEd, ’83 EdS, a champion of education, diversity, arts, and many other causes, died Thursday, September 28, 2017. 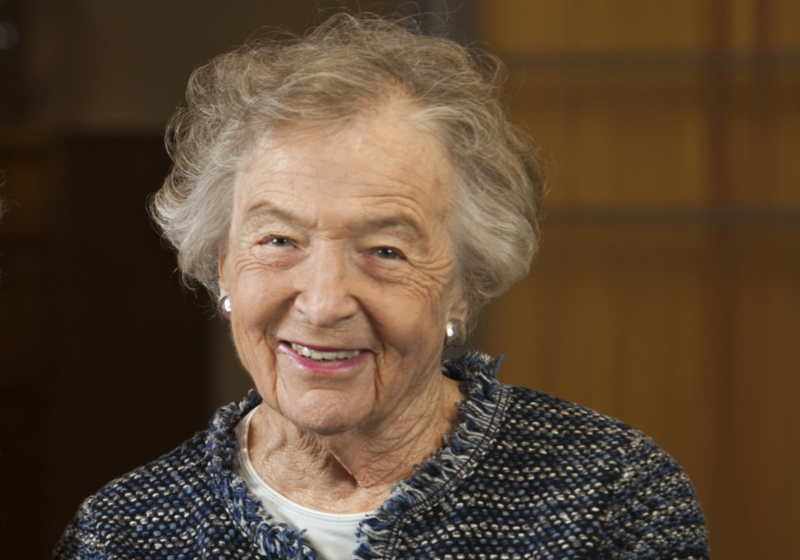 In addition to being a University of Lynchburg graduate and a longtime member of the Board of Trustees, she was a philanthropist and leader who spurred many programs in the Lynchburg community. A memorial service will be held Monday, October 2, at 11 a.m. at Temple Agudath Sholom in Lynchburg. Born in Baltimore, Maryland, Schewel graduated from Hood College and came to Lynchburg when she married Elliot Schewel. While serving as a reading specialist and teacher for learning disabled students in Lynchburg City Schools, she earned two graduate degrees at University of Lynchburg: an MEd in 1971 and an Ed.S. in 1983. She was a faculty member in the School of Education and Human Development from 1973 to 1992 and served as mentor, facilitator, and leader. She provided leadership for numerous projects at the College, such as building the Thompson education building, starting the nursing program, and instituting the faculty-in-residence program. Schewel also served on the University of Lynchburg Board of Trustees for 36 years, from 1980 to 2016, and was chair of the board from 1998 to 2002. Outside of University of Lynchburg, she devoted herself to philanthropy and volunteer work for causes such as civic engagement, civil rights, and education. She was a founder of the Lynchburg League of Women Voters and the first woman to serve as president of the Agudath Sholom Congregation. She served organizations such as New Vistas School, the Anne Spencer Foundation, and the Governor’s Commission of Education for All Virginians. In recent years she helped start Beacon of Hope, an organization devoted to helping all Lynchburg City Schools graduates pursue post-secondary education. In 1992, Schewel and her husband, Elliot, created the Rosel Schewel Lecture in Education and Human Diversity. University of Lynchburg honored her with an honorary doctorate in 2000, and in 2012 the College renamed Centennial Hall as Elliot and Rosel Schewel Hall to honor the couple’s contributions and leadership. Schewel received the T. Gibson Hobbs Memorial Award and the Distinguished Alumni Award, both presented by the University of Lynchburg Alumni Association. Other awards include the Mayor’s Award of Excellence in 2004 and the Virginia Center for Inclusive Communities Lynchburg Chapter Humanitarian Award in 2016.